A web portal for expatriates and global employees residing in Japan and Asia Pacific is launched to meet the increasing demand for a comprehensive guide of international schools. When we search for schools for our children, we need to understand the schools philosophy and try to match to see if it would be suitable for our children. Searching for international schools has never been easier for expatriates and global trotters as Assion, Inc. , Japan's No. 1 Preschool Portal Site preschool-navi.jp rolled out it's much anticipated new service, INTERSCHOOL-NAVI.COM which focuses on introducing international schools around the world. During the beta phase, listings are limited to Japanese schools only, but expansion plans are being made to expand to Asia Pacific countries in early 2013 and other parts of the world by end of 2013. According to Yoshinori Kou, Director of Assion, Inc. and manager of the website, there aren't comprehensive school listing sites which post independent views of each schools. "Each international schools is different and has their own character" says the executive, who has been in the online media field for more than 7 years. "When we search for schools for our children, we need to understand the schools philosophy and try to match to see if it would be suitable for our children. For example, some schools only encourage English with local cultural classes while other schools might offer both English and Japanese language mastery for the children. Of course there is a matter of choosing by accreditation but the essential thing is to find a good match which will fit your children". Economic downturn due to the Lehman crisis and recent events of earthquake and nuclear radiation hit the expat community hard but this was a thing of the past. Expats are returning to Japan gradually. However, the parents have been more sensitive to the affordability of education plans. The fees are vague and some schools make it difficult to really estimate how much the whole process would cost their family. "We are trying to provide the clearer picture of the whole cost structure so that the parents can make informed decisions for their children's education plans", says Kou. 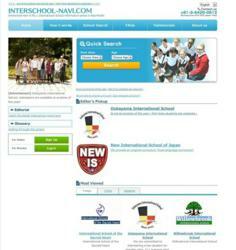 "Interschool-navi.com is a natural expansion from our current service. We created and have been managing preschool-navi.jp for 4 years", says Kou. First started as a niche media in 2009, preschool-navi.jp has emerged as a big player in the preschool industry. It has the most comprehensive guide to preschools in Japan with a listing of 370 schools. "Now we are expanding the service to international schools, first in Japan and globally in the near future.". Although still in beta, the site is actively gathering school listings from around Japan. For international schools, their service doesn't charge initial fees as it is productivity-based. Interschool-navi.com only charges schools only when a student enrolls in a school through their website. Fees vary between countries but it is low enough for all schools to participate into this service. Assion, is a Tokyo-based company, is operating 2 educational portals, namely preschool-navi.jp which is utilized by hundreds of preschools mainly in Japan to reach out to thousands of parents who are looking for the best preschools for their children and newly launched interschool-navi.com which caters toward parents looking for international schools in Japan. We also provide digital marketing consultation advice to national Japanese brands such as Nomura Securities, Benesse Holdings and Johnan Academic.